High Viscosity Mixer (DOUBLE HELIXX) | ARDE Barinco Inc. Positively mix, knead, and stir high viscosity mixtures and pastes. 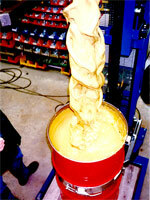 Mix high viscosity materials in half the time. You may have heard claims like that before, but chances are you've never seen anything like this before! Double Helixx mixers from ARDE Barinco are built around two separate mixing shafts with a unique open helix design. The tools are intermeshed, and counter-rotate upon each other to mix, stir, knead and disperse high-viscosity materials. The helical blades create a positive folding action that results in fast, efficient mixing of high-viscosity liquids, pastes, dry or moist powders...even media as viscous as wet sand. 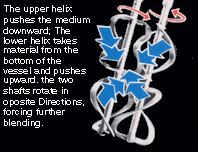 All Double Helixx mixers ensure thorough mixing throughout the entire batch because they operate in planetary fashion. Larger models accomplish this by either a motorized base that rotates the mixing vessel, or mechanical rotation of the dual mixing tools themselves. Medium-size models have a free-swivelling base that lets the media's own viscosity create the rotation. The smallest, hand-held models are light enough to be moved around manually. Download/Print Brochure Documents may take a moment to download. Your patience is appreciated. In the plant or factory, free-standing Double Helixx models mix everything from hash-style food products to multi-component epoxies to cream honey. 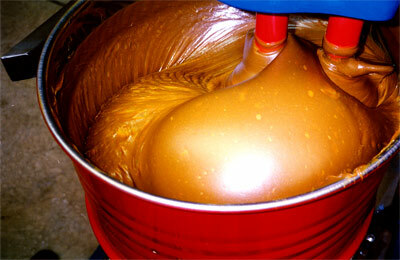 Even in the largest batches, they provide complete, even mixing from top to bottom. The hand-held models were specially designed for on-site use. They can mix common industrial compounds such as mortar, floor finishes, liquid plastics, coating compounds, paint, varnishes, and adhesives in virtually any vessel: a wheelbarrow, bucket, or even the medium's own shipping container. The Double Helixx is available in a wide variety of sizes and configurations to handle a broad range of mixing applications. The blades are made of mild or stainless steel, and can be flat or round. Electric and pneumatic units are available.